Jump Discontinuity: A discontinuity where the value of function 'jumps'. This is where the right hand limit and left hand limit exist, but are not equal to each other. 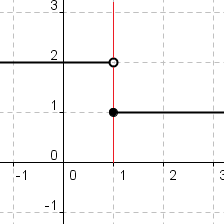 Figure 1: A function with a jump discontinuity at 1. A jump discontinuity is a discontinuity where the value of a function 'jumps'. In more exact terms, a jump discontinuity occurs at a value of the independent variable where the right hand limit and left hand limit both exist, but these limits are not equal to each other. McAdams, David E. Jump Discontinuity . 12/21/2018. All Math Words Encyclopedia. Life is a Story Problem LLC. http://www.allmathwords.org/en/j/jumpdiscontinuity.html.